Biofuels made from organic material may help to cut out oil and gas, but growing all that corn and soy takes its own environmental toll, and biofuels still create emissions when they’re burned. Switching fields of edible crops over to energy production could also drive up food costs and contribute to food scarcity. But even as other renewable technologies like solar and wind gain ground, there are still scientists and companies betting that with the right species cultivated under the right conditions, plant-based fuels can play a sustainable and cost-effective part in a clean energy future. Pongamia, a shady legume tree native to Southeast Asia and parts of Australia, has been picking up hype as a potential source of biofuel feedstock, promising higher yields while using significantly fewer resources than comparable crops. 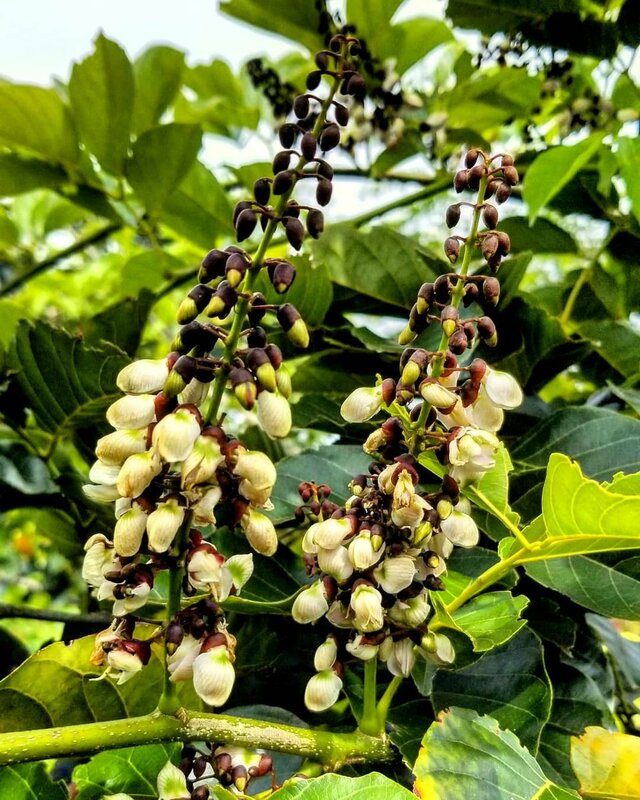 Pongamia has traditionally been grown as an ornamental tree for its white or pale purple flowers, and for the oil that can be harvested from the tree’s light brown seeds, which look a bit like a cross between an almond and a lima bean. Long used as an ingredient in Ayurvedic medicines and skin care products, the oil can also be made into biofuel, and pongamia proponents hope to develop a host of secondary products, like animal feed, from the remaining seed material. “What’s great about pongamia is it uses much less water, fertilizer, or pesticides than most other crops,” says Naveen Sikka, founder and CEO of TerViva, a U.S. pongamia producer with operations in Hawaii and Florida. A particularly resilient species, pongamia is also perfect for growing on land that is underutilized, depleted, or otherwise unsuitable for growing food. For farmers struggling with unproductive acreage, pongamia has the power to “transform resource-constrained and distressed agricultural lands into productive sources of protein and renewable bioenergy,” says Sikka. The tree is “very robust and can grow in a large range of environments and conditions,” explains Peter Gresshoff, a pongamia expert and former director of the University of Queensland’s Centre for Integrative Legume Research. He says the hearty trees are “salt-tolerant and if beyond the seedling stage, drought-resistant.” And where other plants might require nitrogen to be added to the soil, as a nitrogen-fixing legume, pongamia’s roots carry bacteria that produce nitrogen for the plant, meaning producers can count on lower fertilizer costs, says Gresshoff. Not only does it require less input, but a pongamia operation also produces considerably higher yields than say, soy, making it a more efficient crop on both ends. “Biofuel producers end up with “400 gallons [per acre] compared to 40 gallons for soybeans per acre,” says Sikka. Pongamia pods, which cluster along the tree’s flowering branches, are harvested mechanically with farming equipment that shakes the trees until pods fall off, a technique often used for crops like pistachios or olives. TerViva uses a low-tech press calibrated for soybeans to process the seeds, producing oil that becomes biofuel, and seedcake, the protein-rich mash left over after making the oil. “The seedcake also has several markets, including use as an organic fertilizer or as livestock feed,” says Sikka. Naturally bitter and inedible, pongamia producers say its seeds can be treated to make a palatable feed for animals, and some are even looking into developing secondary products that could be used as ingredients in food for people. “Human food is perhaps a bit far,” says Gresshoff, though he sees potential in creating animal feed products from pongamia. In Florida, says Sikka, “much of the state's signature produce—oranges, grapefruits, and tangerines—have been hit by an incurable greening disease that has ravaged groves and forced citrus growers to abandon fields.” Spread by tiny insects called psyllids, citrus greening disease has destroyed millions of acres of citrus trees around the world. Florida farmers have been particularly hard hit; this year the state’s citrus production levels fell to their lowest point since WWII. Years of steady decline in demand for orange juice have only compounded citrus farmers’ woes. In Hawaii, high production costs and a competitive market have led sugarcane farmers to abandon their fields; many large sugar and pineapple farms in Hawaii are now idle. “Sugarcane acreage in Hawaii has declined by 200,000 acres in the past few decades,” says Sikka. TerViva is hoping that pongamia, which can be grown on the same land as oranges or sugarcane, with much of the same equipment, can provide relief to the growers and economies of areas like Hawaii and the Sunshine State, without displacing active food production. “Being in citrus where we have fought hard for 10 years, and we’re fighting a losing battle where we’re having to lay off people, I see a crop that will provide jobs for those same people,” Peter McClure, TerViva’s chief agricultural officer and a former citrus farmer, told the Southeast Farm Press in March. One of the reasons for the pace of pongamia’s development, he says, is that “investors want short-term profit; this is a tree and involves a follow-up industry.” (Pongamia trees take 3-5 years to grow to full productivity.) New industries, like the pongamia biofuel business, require “deep pockets and patience,” says Gresshoff. Renewables like solar and wind may have more of the public’s attention right now, he says, but “sadly these are not fuels, meaning the energy is not easily stored. Thus they should be combined with a biofuel strategy.” Going forward, Gresshoff thinks people will need to “accept a cocktail of energy sources,” with biofuel from pongamia being one of them. Last year, the company announced a partnership with land developer Alexander & Baldwin to convert 250 acres of former sugar plantation lands in Maui to pongamia production. In Florida, the company has made a deal with the Hardee County Economic Development Council, which represents a major citrus-growing area, to establish a permanent oil production facility in the state.